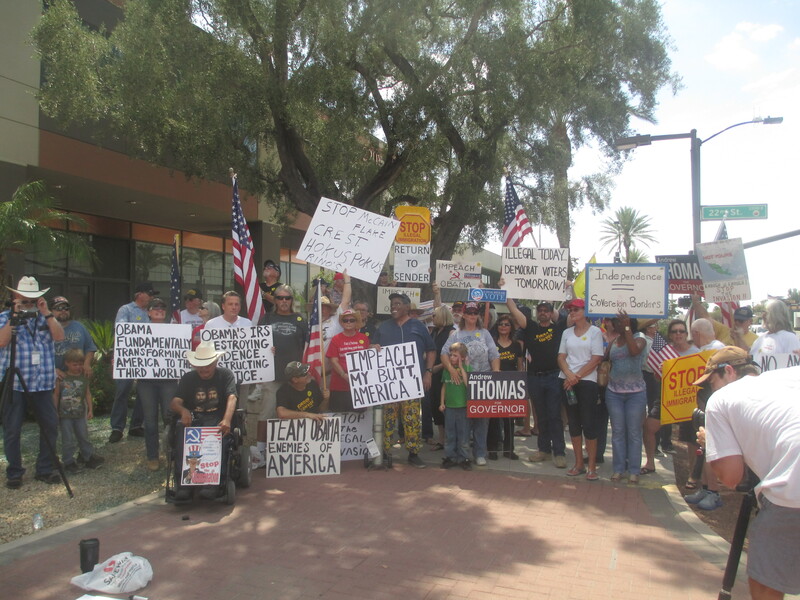 During the Border Convoy protest of August, 2014, protesters held signs that directly attacked Obama and John McCain. The signs referred to impeaching Obama, that Obama was turning the US into a Third World country and held Obama and McCain responsible for the Illegal Alien Invasion. Obama is illegally opening the flood gates for a mass invasion of illegal aliens into the US. It needs to be made much more personal against Obama and the politicians that support him. The crowds have to grow much larger and more angry. During normal times when politicians may be responsive it is more appropriate to just stick to the issues and stay away from personal attacks. But these are not normal times. These are revolutionary times. The current system will go under, if ordinary citizens do not speak up forcefully in very large numbers, due to the enormous subversive influence being applied at this time from Obama and his cohorts, like McCain. So, I applaud what Pete Santilli is doing here, getting up close and personal with John McCain, the Republican cultural Marxist, who is only too anxious to sell the US out. The same kind of thing should be done to Obama, wherever he goes. When you have someone in the White House, who is clearly trying to subvert the system, he ought to be attacked directly and harshly. When politicians allow laws to be broken and the Constitutional trampled, it needs to get very personal. Some of these politicians truly ought to be jailed. These crooked, greedy politicians will not back off their seditious plans unless they have a real fear of being swept away by public anger. Two of my favorite people, members of your Impeach Obama force, Robin and Dan, were in this convoy. Dan returned to California after the rally at McCain’s office. Robin left the next morning from El Paso, after the illegals (La Raza, etc) tried to run them off the I-10, and stopped on the freeway right in front of Santilli’s motorhome to get them all to crash into each other! Eventually, after an investigation, the driver was arrested! And thank God for the Citizens Militia that got the convoy safely away from the cartels…45 miles away to a safe location! God bless those guys!